Everence Federal Credit Union places a premium on stewardship and sustainability. Those values are baked into a green auto loan, a socially conscious investment portfolio, and credit card rewards options. “If you are a person who embraces the idea that we should take care of the things we’ve been entrusted with — whether time, talent, health, or relationships — you can join the credit union,” says credit union CEO Kent Hartzler. The credit union places a premium on stewardship and sustainability and puts those principles into action when it designs products and services. Auto loans at Everence make up one-tenth of its loan portfolio. That’s low when compared to an industry in which more than one-third of the portfolio is dedicated to auto loans. But Everence’s portfolio might start to more closely resemble the wider industry’s thanks to a discounted rate program for green cars that’s gaining newfound attention. For more than a decade, Everence has offered a discount of 50 basis points to borrowers who buy a hybrid, electric, or fuel-efficient vehicle. That’s changing now along with American views on electric cars. According to a study by AAA, 20% of Americans say they plan to make their next vehicle purchase an electric one. And the options for battery-powered and electric vehicles will grow as global automakers pour $90 billion into the market. Tesla, the dominant player in the market, has three models that totaled more than 100,000 vehicle sales each in 2017. Hartzler says Everence takes hundreds of auto loan applications per month from members looking to finance a Tesla using the green auto discount. Health savings accounts comprise approximately 9.6% of Everence’s total deposit portfolio, the fifth-highest percentage among all credit unions in first quarter 2018. Why so popular? The credit union pairs the transactional element of a traditional HSA with the option to invest funds into a suite of socially responsible mutual funds held and managed by the Everence Trust Company, with which the credit union has a custodial relationship. “There are some offerings like this out there, but you’d have to find a big institution or one specialized in this sort of thing,” Hartzler says. According to Hartzler, Everence pays 25 basis points on its standard HSA deposit accounts between $3,000-$25,000 and 35 basis points on deposits greater than $25,000, although he anticipates rates will rise before the summer ends. The mutual funds option offers depositors a potentially greater return (click here to view performance data). Members pay $3 per month for the option to invest in the mutual funds. There is no cost to transfer funds, and there are no transactional limits. Hartzler finds HSAs to be a particularly sticky deposit product. 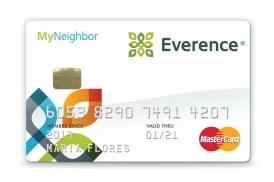 In April 2017, Everence launched its MyNeighbor credit card that gives cardholders the option to donate to select charitable organizations. Each time a member uses the credit card, Everence donates 1.5% of the transaction amount to one of 9,000 eligible 501(c)(3) organizations selected by the member. In the first few months of 2018 alone, members donated more than $200,000 to 265 charitable organizations. Everence's MyNeighbor credit card gives members the ability to generate donations for their favorite charitable organization. Read the fact sheet here. Additionally, the credit union dedicates 10% of the income generated from its VISA credit card program purchases to support for the church and mission groups, it caps interest rates on credit cards and loans at 6% for those whose missions or other voluntary service affects their ability to meet financial obligations, and it runs the Everence Sharing Fund, which awarded nearly $900,000 in grants to churches and communities in need in 2017. These are just three examples of the way Everence lives out the seventh cooperative principle: Concern for community. And Everence is just one example of a credit union that sets forth every day to make a difference in the lives of its members and in its communities — marrying principles with practice.